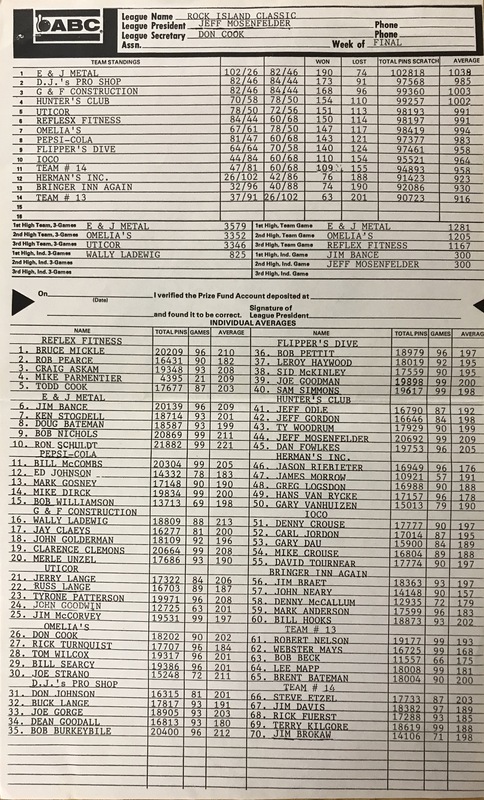 Final standings and payouts for the 1953 Rock Island City Tournament which was held at Topspot. “The modernization and beautification program at Central Bowl, 4500 Black Hawk Road, Rock Island, has been completed and the regular summer hours, 9 a.m. until 1 a.m., are in effect. The Central Bowl is closed on Thursdays. The modernization includes 24 new AMF pin spotters. “In John Schuldt’s case last night in the Sportsmen’s league at Sixth Ave. Recreation, a little practice helped to make him perfect. “I threw about five practice frames and slowed my ball and approach down a bit to get the right speed and timing,” he said this morning after opening a 662 series with the second 300 game in the last two seasons in the Sportsmen’s league. In fact, he threw 13 straight strikes before converting a split in the second frame of his second game. 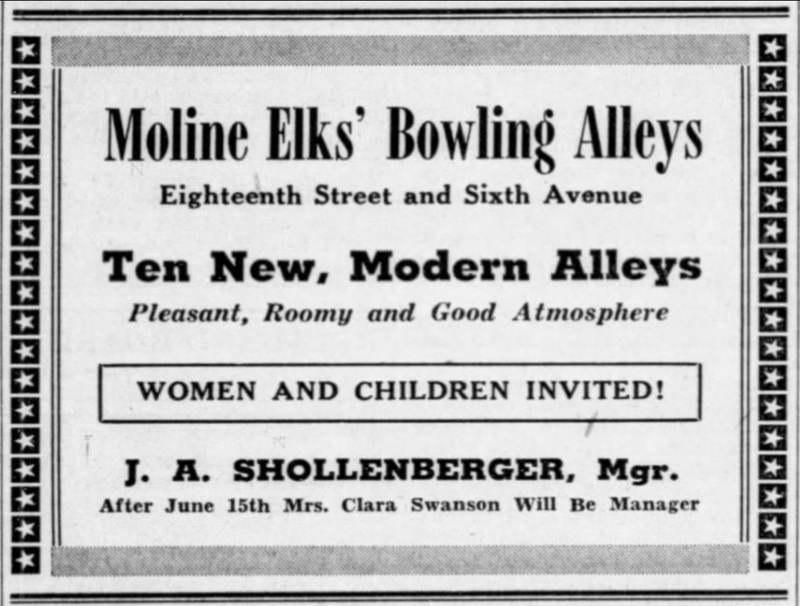 Schuldt’s 300 was bowled on the same pair of alleys that Al Boehme scored his 300 on two years ago in the same league at Sixth Ave. Recreation – No. 3 and No. 4. His 300 game was only the fourth in the history of Sixth Ave., and only the second one there since 1950. The intrigue of his game, however, is amplified by the fact that his 11-year-old son, Ronald was watching, his brother Clyde has recorded a perfect game, and his wife Cleona is a pretty fair bowler too. Schuldt bowls for the Ray VanHoorweghe’s Tap team and just came back to the Sportsmen’s league this season after a few years absence. “I bowled in the Sportsmen’s league for about 11 straight years and then quit for a few years,” he said. “I’m pretty proud of him,” Mrs. Schuldt said. “He didn’t come right home, but that’s O.K.,” she laughed. His string was broken in the second game when he fired a strike, then converted a spare, then had a split and came back with a strike in the fourth frame. His series included the 300 game and a 179 plus a 183. 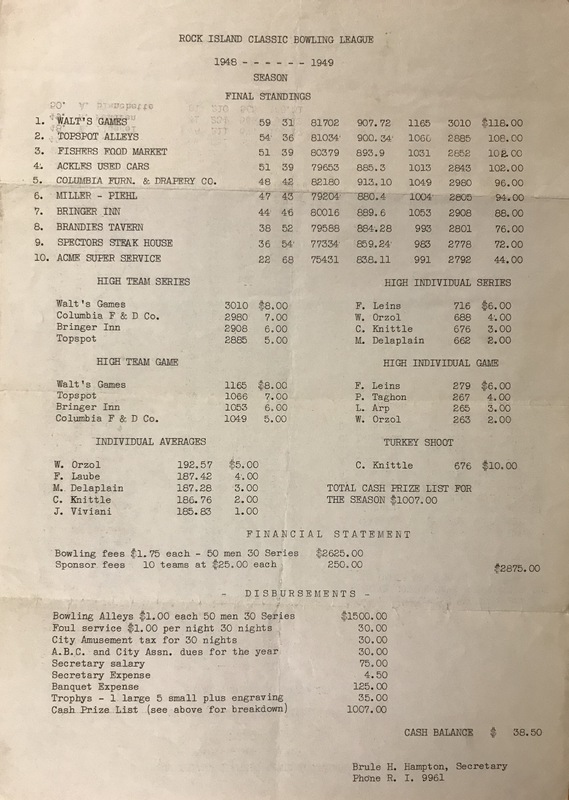 For his accomplishment, he’ll receive a $50 cash gift from Sixth Ave. Recreation, a diamond award (either a ring, tie pin, belt buckle or wrist watch) from the American Bowling Congress, an award from the shirt manufacturer who made his, and numerous other prizes from bowling equipment makers. 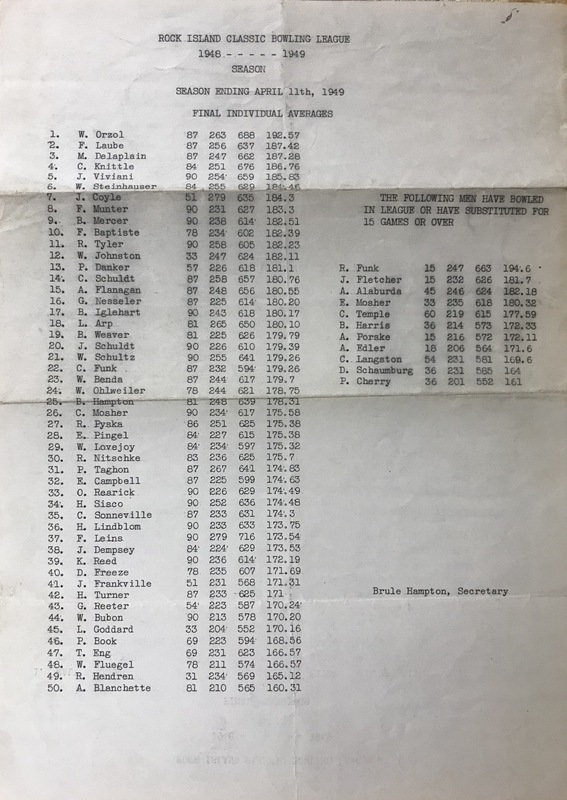 “Moline bowling enthusiasts, some 2,000 strong, will have begun the 1947-1948 league kegling season before the middle of the month. 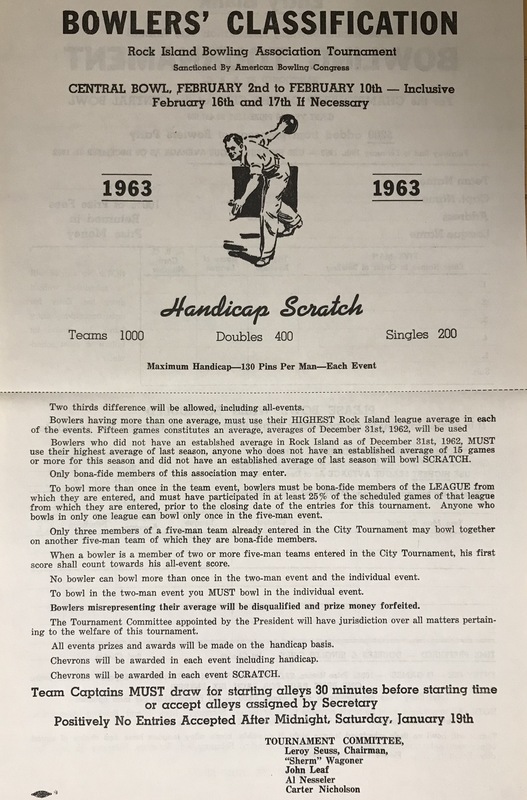 East Moliners will compete in many of the Moline leagues as well as on the Rocket alleys at home to boost the total to more than 2,500. All of the old well-established loops have returned to the maple warfare, and a number of new circuits have signed for alley time to make the 70-league season the greatest in history. Most of the problems that faced the alley managers last year seem to have been remedied, for he pin boys and the hardwood sticks appear more plentiful. Andy’s Playdium has a list of league entries 18 loops long set for action and with more indicating they may come in later. The LeClaire alleys will house 15 leagues, including the 20-year-old Uptown, Twin-City Girls and Moline Majors. Simpson’s will have seven leagues bowling, but will save all the time on both Saturday and Sunday for the open bowlers. The Y.M.C.A. alleys with five loops will also keep Andy’s Little Shots tourney alive during the winter months with meets on Saturdays. Elks Alleys leagues number 18, and include the Tri-City Classic at 7 on Thursdays. Six afternoon leagues will roll at the Elks alleys, and one morning loop on Sunday. The Rocket Alleys in East Moline will have at least 11 loops and may make room for several more. Saturday will be reserved for open kegling. 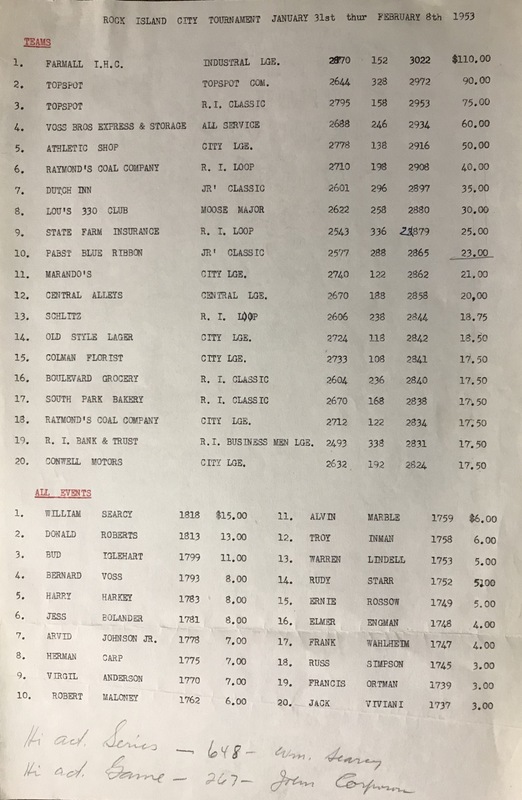 The first two photos are the final 1948-1949 season standings for the Rock Island Classic league, held at the Topspot Alleys. 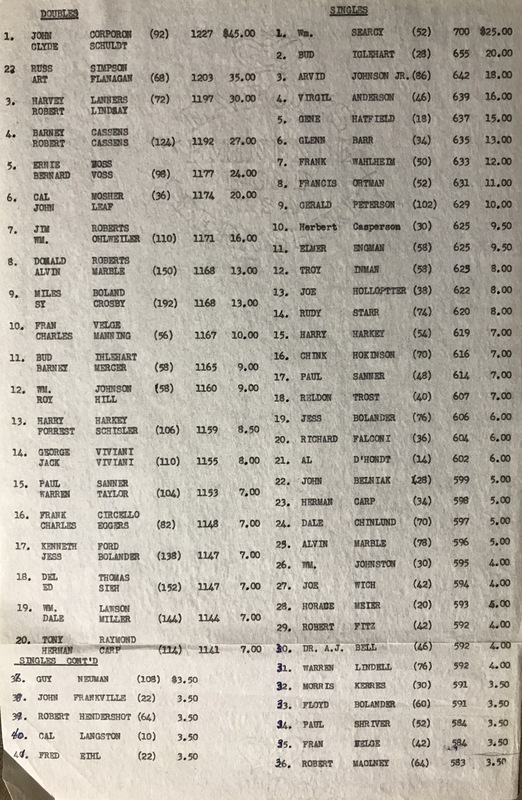 The third photo is the final standing sheet for the 1994-1995 Rock Island Classic league season, which was held at Town & Country.